Despite having only launched 5 or so weeks ago along with the iPhone 4S, hacking Siri has already become something of a spectator sport, with a seemingly endless range of possibilities. You may or may not have caught our coverage the other day of how hacker plamoni, using the protocol hack of last week to create a proxy server from which to send and receive Siri commands, managed to manipulate his iPhone 4S to control the thermostat. 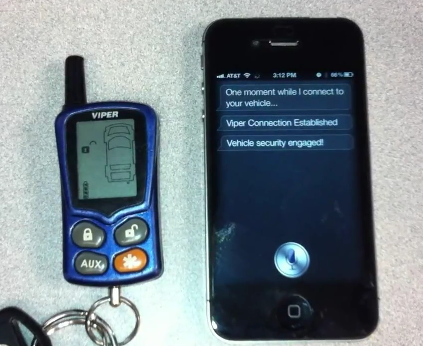 Off the back of that, another intuitive soul has quite literally revved things up, taking the developments of others to hook Siri up to his Viper car remote, allowing him to use voice commands to turn his vehicle on and off. While Siri has (and perhaps always will) encourage skepticism, it’s hard to remember a feature from Apple with so much promise. To think of the developments made in only one month makes for a very exciting future of voice-recognition. Aside from the various ports to older iDevices, there’s also been the gizmo which detects brainwaves and converts them to Siri commands (long way off being an outright mindreader, but I digress); the parody video of Siri being caught in a marital debate, while humor inducing, suddenly doesn’t seem beyond the realms of possibility. We know now there is no way, despite the work of the talented hackers, that Siri will be fully ported through to the iPhone 4, 3GS, or indeed any other touch-based iDevice due to the typically-Apple hardware adjustments found solely in the latest and greatest iPhone 4S. That said, hacks like this only go to show that there could be many useful possibilities across the greater gadgetsphere.